Several passengers are shown waiting inside a terminal at Los Angeles International Airport after they were forced to leave Spirit Airlines Flight 868 Nov. 2, 2015, for protesting a flight attendant’s treatment of a black couple. 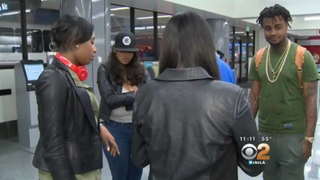 A discussion about an overbooked seat led to six black passengers being kicked off a Spirit Airlines plane at Los Angeles International Airport Monday, and those passengers are claiming discrimination. According to CBS News Los Angeles, a flight attendant asked a couple to change seats because the airline had overbooked. Witnesses say the couple told the attendant that asking them to move was unfair because they'd done nothing wrong. The flight attendant reportedly called the police to have the couple escorted off the plane. When some passengers protested the couple's treatment, the flight attendant asked police to remove them from the plane, too. "I'm really humiliated, just for the simple fact that you hear about this type of stuff happening in America, discrimination issues and stuff like that, but to actually experience it firsthand … " passenger Alexandria Wright, who was escorted from the plane, told CBS News. Witnesses told the news station that passengers were removed from Flight 868, headed to Dallas, after a white flight attendant told police that the group was a threat. "It's a business dispute," LAX police spokesman Rob Pedregon told the New York Daily News. "It's up to [Spirit] to define what is disruptive." Spirit Airlines issued a statement to CBS News explaining why the additional passengers—not the original couple—were asked to leave the plane. "Four passengers became unruly and were causing trouble with other passengers," the statement read, according to CBS News. "Flight crew asked them to stop. When they did not, law enforcement was called and they were removed from the flight." Wright told the news station that the four people asked to leave the plane after the initial incident weren't the only people on the plane having a conversation about what they'd just witnessed. "It was more than just us having the conversation. Why is [it] that six black people got kicked off the plane?" Wright asked. According to the news station, the flight was delayed an hour, and all six passengers who left the plane were given hotel vouchers, Pedregon told the Daily News. Read more at CBS News Los Angeles and the New York Daily News.